Camellias can be propagated by grafting, cuttings, layering, air layering, and seeds. Each of these methods is discussed below. Producing flowering camellias from seed or cuttings is a slow process. One method of producing flowering plants in a much shorter time is by grafting. 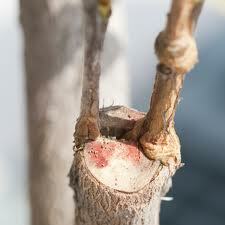 While it may take three to six years for a rooted cutting to flower, a graft will likely flower the second year. To understand grafting, it is important to know the terms "scion" and "understock" or "stock." The scion is the part of the stem containing a growth bud of the variety one wishes to propagate. 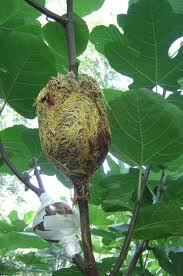 The understock or stock is that portion of the plant that furnishes the root system. 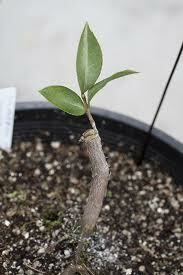 A stock that is 1/2 inch in diameter is most desirable; larger stocks are generally not suitable for grafting. The best season to graft is late winter to early spring, just before new growth begins. 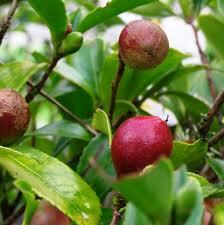 Camellia sasanqua is often used as understock because it is resistant to root rot disease. Cleft grafting is one of the most popular methods of grafting and is described below. 1. Prepare the stock by cutting off the top with sharp shears or saw about 2 to 4 inches above the soil. Make a sloping cut and trim smooth with a sharp knife. Using a grafting tool or a heavy knife that may be tapped with a mallet, drive the blade into the stub to split the stock vertically through the center so a split extends about 2 inches into the branch. 6. Callusing should start within a few weeks and should be firmly knit in about two months. When firmly callused, raise the jar very gradually. If possible, choose a cloudy, humid day when removing the jar to minimize wilting. Raise it a few inches at a time. If wilting appears at any time, put the jar back on until wilting stops. This is the most critical part of aftercare. Grafts usually grow 15 - 30 inches the first season and often bloom the second year. Do not fertilize the first year. 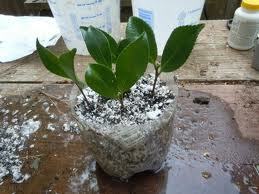 One of the most common methods of propagating a camellia is by rooting cuttings. It is not the quickest method, but it is the easiest and least expensive way to reproduce plants. One advantage in growing cuttings is that the resulting plants will be exact duplicates of the original plant. However, if the cutting is taken from a branch that flowers a mutation (sport) of the original cultivar, often the cutting will be a reproduction of the sport rather than the original plant. Not all camellias root readily from cuttings, but with good facilities, bottom heat, continuous mist, and rooting hormones, almost any camellia cutting can be rooted successfully. Cuttings of new growth are the easiest to root. They should be taken soon after the tender growth matures and hardens. The cut should be made below the fifth node (the node is the tiny bud-like growth at the base of the leaf junction with the stem). A tapering cut should be made at the base of the cutting. This allows more surface for roots to develop. To reduce dehydration, remove the leaves from the bottom of the stem, leaving two or three leaves at the top. This will expose eyes from which roots can develop, in addition to those at the cut end. Less leaf surface allows more of the plant's energy to go into producing roots instead of supporting extra leaves. A good growing medium consists of one-half sand and one-half peat. Coarse sand alone can be used, as well as vermiculite and perlite, either alone or in combination with sphagnum peat moss. A medium which is barren of nutrients induces the plant to send out roots in all directions to search for nutrients. Any box, pot, container, or bed at least 4-6 inches deep with good drainage is suitable for the medium. Applying rooting hormone to cuttings before inserting them into the medium may speed up the rooting process, but is not necessary for success. 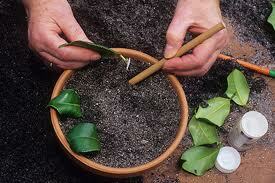 Place cuttings in mixture about 2 inches apart and 2-3 inches deep. A pane of glass, newspaper, or cheese cloth over the pot will help retain moisture. Cuttings should be kept moist, but not wet, at all times. A centuries-old propagating process developed by the Chinese consists of layering (rooting) plants by placing sections of branches that are still attached to the plant in the ground and covering them with earth, having first removed or roughed the bark on the underside. Once roots have developed on the covered branch, it is cut off and planted. Air layering probably developed from the discovery of the layering process, but with the rooting medium in the air instead of in the ground. It is a simple process and can reproduce good-sized plants in one year. It may be done at any time of the year, but the best time is in the early spring when the plants are beginning to grow. Directions follow. 1. On a healthy limb completely remove a ring of bark 1 1/2 to 2 times the diameter of the branch to be air layered. This should be 12 - 18 inches from the tip of the limb. Two parallel cuts should be made with air layering scissors or a sharp knife, and the strip lifted off. Although the branch may have new growth at the tip, the place where the cut is made must be on hardened, mature growth. 2. Eliminate all traces of the cambium layer (green tissue) by scraping with a knife. Dust the exposed surface with a rooting hormone powder recommended for hardwood cuttings. 3. Squeeze a handful of presoaked sphagnum moss to remove excess water, and cover the ringed area with it. Wrap this tightly with medium weight plastic wrap and secure with twist ties above and below the ball of moss. Cover this ball with a square of aluminum foil, dull side out, to discourage birds' attention. 4. Air layers started in the spring usually form roots by late summer or fall. The air layer will feel harder as it develops roots. 5. When the roots are visible through the moss, or when the root ball feels hard, cut the limb from the mother plant at the bottom edge of the moss with sharp scissors. Remove the plastic. 6. Do not remove the moss as it may damage the tender roots. Best results will be obtained by planting first in a container, although it can go directly into the ground. Growing plants from seed presents the gardening enthusiast with a real challenge. Camellias do not come true from seed, and only rarely is a good plant produced. Out of thousands of seedlings, the chances for a superior variety are slim. Camellia seeds ripen at different times depending on variety and location. If you are not able to plant the seeds immediately upon cracking, soak the seed for 12 hours, or crack the hard coat to help germination. Plant in good soil, peat moss, or a combination of peat moss and sand. Keep the soil damp. Seeds usually germinate in one month. Transplant into containers or outside. Cutting off the tap root will encourage a more fibrous root system.